To receive automatic updates of the latest news as it happens Join Our Free Mailing List & receive a free MP3 into the bargain! We have just released our latest video for one of our past singles "The Love Of A Child", which was written by BG Pollock from Co Armagh about our daughter Sherese who was born May 2013. It was filmed over a six month period in 2017 and features Sherese. 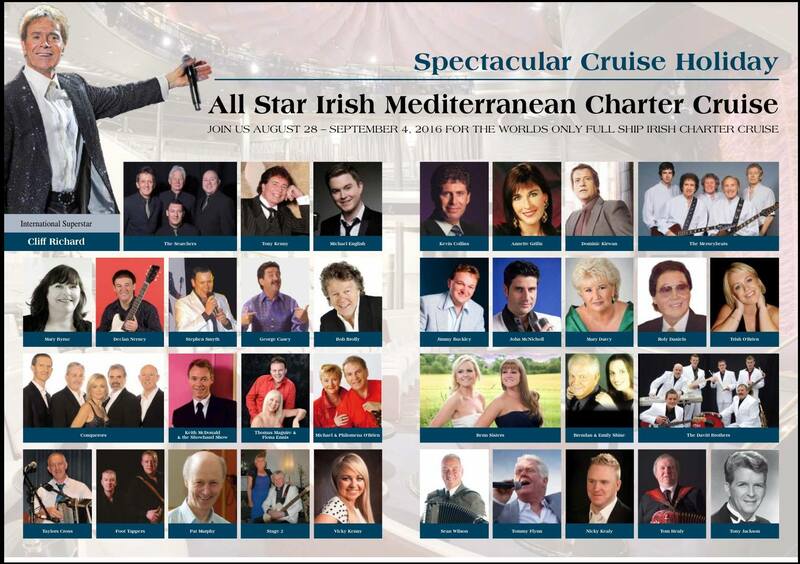 We look forward to our very first appearance on Gerty Byrne's Mediterranean Cruise and look who's topping the bill, Cliff Richard. After a seven month break from the music scene with the birth of their daughter Sherese 15th Aug 2013, Thomas & Fhiona started back on the road as a duo on 31st Dec 2013 at The Rhu Glenn Country Hotel, Waterford. After 13 successful years on the road touring with a full band they decided that the time was now right to cut things down and are now available as a self contained duo concentrating on the Social Dancing scene which gives them more flexibility and freedom etc with regards to their new family life. Up until now they have been gently easing their way back into the gigging circuit but are now available for all Social Dances, Guest Appearances, Concerts, and Weddings etc. Fhiona has been nominated by RSVP magazine and we'd greatly appreciate if you were able to find the time to place your vote for her. Thomas & Fhiona are currently taking a little time out of the music business to enjoy the arrival of their newborn girl Sherese and will return to the stage later this year. 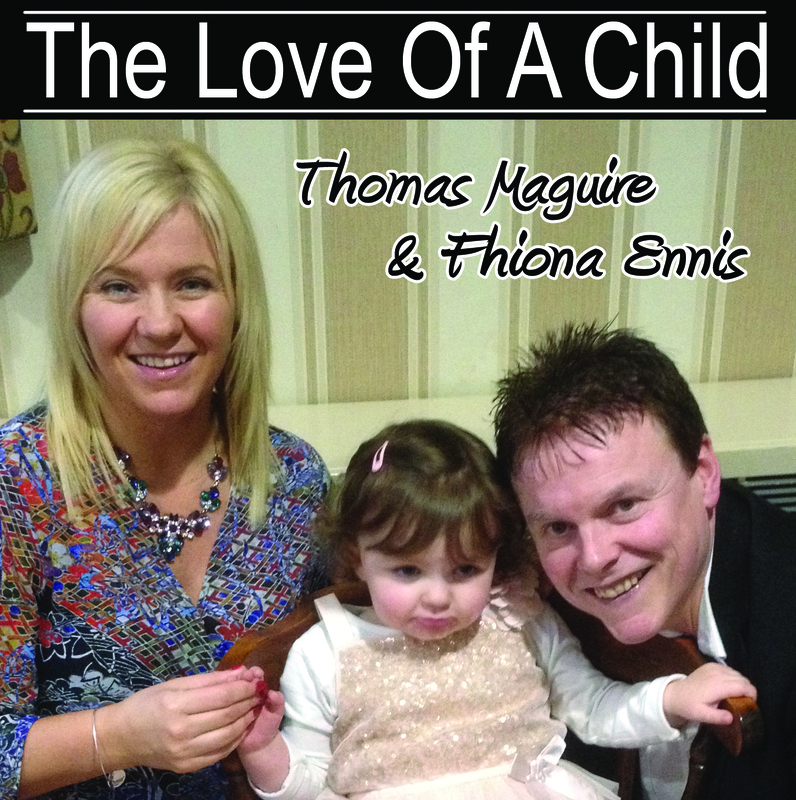 Thomas & Fhiona's concert in The Ardhowen Theatre, Enniskillen Thur 22nd Nov 2012 will be recorded live on the night for a DVD release, come along and be part of it. With special guest Patrick O’Sullivan, TG4’s 2009 Glor Tire winner from Co Cork. NEW SINGLE RELEASED 13TH AUG 2012 - "I WANNA BE MARRIED"
Thomas & Fhiona were voted "Country & Irish Duo Of The Year 2012" at The Tipp FM Awards held at The Clonmel Park Hotel on Wed 23rd May 2012. Thomas & Fhiona were voted "Vocal Duo Of The Year" at last week's Hot Country Television Award Ceremony held at the Hazel Hotel, Monasterevin. Thomas & Fhiona were voted "Duo Of The Year" at The Farmer's Journal Irish Country Sound Awards held at The Hodson Bay Hotel, Athlone on Monday 23rd April 2012. The new series of Glor Tire on TG4 Television starts Wed 14th Sept. where you will get a chance to preview all the contestants. Thereafter, every week you will see one contestant per week along with their mentor and their respective band. Thomas, Fhiona & the band along with their contestant Jacqui Bannon (Co Fermanagh/Co Cavan) appear on the Oct 19th programme. Voting commences Sept 14th so please get behind Jacqui and give her your votes! Thomas, Fhiona & the Band have recently recorded a live set for the new series of Glor Tire on TG4 Television which is to be aired in October. Their contestant for the series is Jacqui Bannon who hails originally from Co Cavan, but now resides in Co Fermanagh. Please get behind her and vote! Thomas, Fhiona & The Band have been voted best band of the year for the second year running at The Northern Nashville Country Music Club, Thurso, Scotland. Thank you to everyone who voted for them and to Christine Gray and all the gang involved in the club. 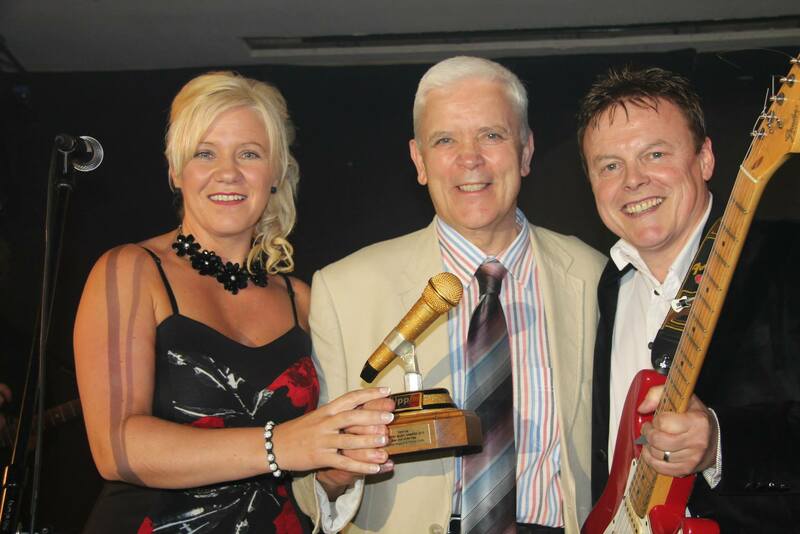 Thomas & Fhiona were delighted to receive a beautiful award for "Vocal Duo Of The Year" at The Hot Country Awards 2011 held at The Carlton Shearwater Hotel in Ballinasloe, Co Galway. Thank you to everyone involved in The Hot Country Crew, especially Hugh O'Brien. 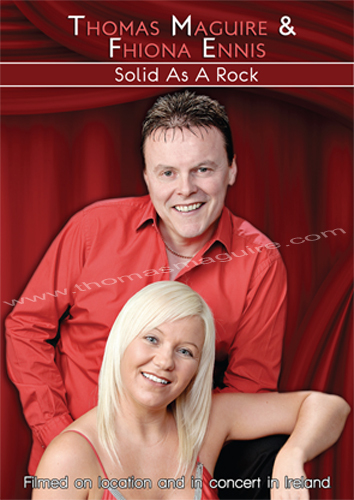 Thomas & Fhiona were delighted to receive an award for "Best Duet Of The Year" for "Solid As A Rock" at the NICMA Awards held at The Tullyglass Hotel, Ballymena, Wed 27th April. Thank you so much to everyone who voted for them, it is greatly appreciated. Thomas & Fhiona shall be appearing at the Northern Ireland Country Music Awards 2011, which is to be held at The Tullyglass Hotel, Ballymena, 27th April 2010. You can vote for Thomas & Fhiona online here. "Come BACK to ireland video"
Thomas, Fhiona & the band make their very first visit to The Orkney Islands, Oct 2010. See gig guide for details. Thomas, Fhiona & the band make their very first visit to The Shetland Islands, Sept 2010. See gig guide for details. 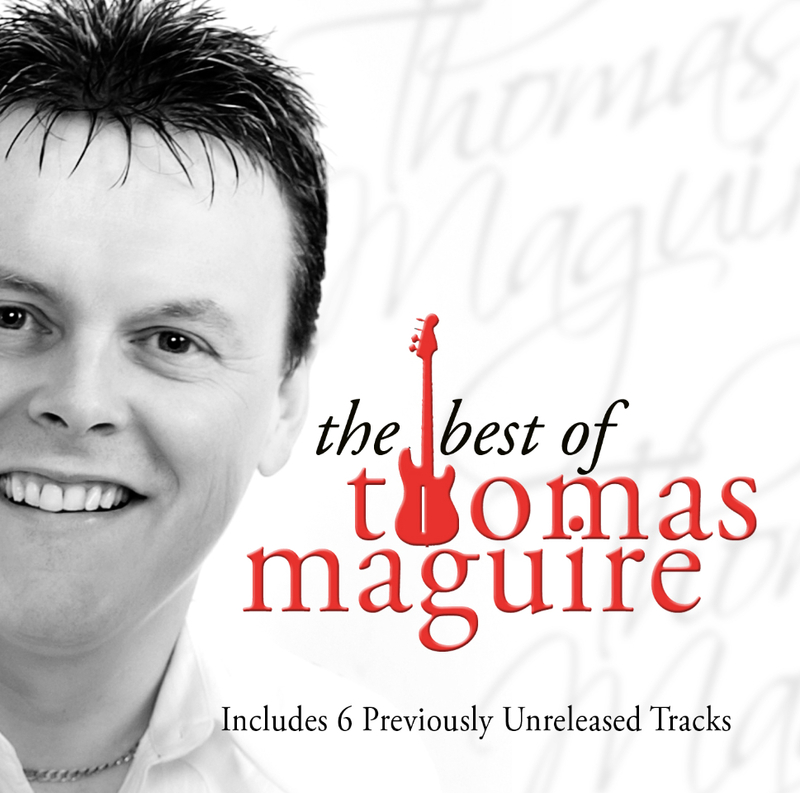 The Thomas Maguire & Fhiona Ennis Band have just been voted “Best Band of the Year 2009” by The Northern Nashville Country Music Club, Thurso in Scotland. Daniel O'Donnell praised Thomas & Fhiona's new album in his weekly column in The Sunday World. Thomas & Fhiona were delighted to receive the "Vocal Duo Of The Year" award at The Hot Country Music Awards held on Mon 10th May 2010 at The Hodson Bay Hotel, Athlone. Thomas Maguire & Fhiona Ennis have been nominated under The Best New Comer category at The Irish Country Music Awards to be held at The TF Theatre, Castlebar, Co Mayo on Thur 6th Aug 2009. To vote for Thomas & Fhiona click on the link below, your votes would be greatly appreciated. Thomas & Fhiona appear this Friday 1st May on the Late Late Show, RTE Television with a multitude of other artists to perform the song written by John Farry "The Ties That Bind" in support of The Meningitis Trust. Thomas, Fhiona and the band are booked to appear at The Halifax Irish Festival on Fri 3rd July 2009 and The Southwark Irish Festival in London on Sun 5th July 2009. At the Limerick 102FM Radio Awards, 9th Feb 2009, Thomas & Fhiona received an award for Best Duo. The N.I Country Music Awards Show 2009 (NICMA) will take place on the Wednesday 15th April at the Tullglass Hotel Ballymena. The event will highlight the achievements and recognize the talents of our countries top country music performers. There are a number of award categories and on the night there will be TV personalities hosting the event, a full live band, and live performances from a selection of the nominees. Acts appearing on the night include:- Jimmy Buckley, Mike Denver, Kieran McGilligan, Philomena Begley, Stephen Smyth, Thomas Maguire and Fhiona Ennis, Dee Reilly, Mick Flavin, Gary Gamble, Kieran McGilligan and The Benn Sisters. Thomas and Fhiona have been nominated for an award at The Limerick 102FM Awards 9th Feb 2009. Some new UK gigs in 2009 for Thomas & Fhiona, Jan 16, 2009 they appear at James McKeefrys Irish Festival on Hayling Island near Portmouth, for further details visit www.mimf.moonfruit.com or ring 01827 64696. Jan 17 sees them at Croydon Irish Club, 020 8657 1099. Thomas & Fhiona appear at the Michael Commins 30 year Celebration Concert at The McWilliam Park Hotel, Claremorris, Co Mayo on Mon 24th Nov 2008 with Mike Denver, Paddy O'Brien, Mick Flavin, Sam O'Doherty, PJ Murrihy, John McNicholl, Eddy Lee & Caitriona, Frank McCaffrey & The Outlaws. Thomas & Fhiona have been nominated for an award at the Glencarn Hotel Awards, Castleblayney, Co Monaghan on Mon 3rd November 2008. Thomas & Fhiona appear at one of Highland Radio's ever popular Concert's in The Mount Errigal Hotel, Letterkenny on Monday 10th November. Thomas & Fhiona For London! Thomas & Fhiona's original gig for The Galtymore has now been re-located to The Crown Moran Hotel, Cricklewood on Sunday 29th June - Tel. 020 8452 4175 - Doors 8.30pm - Dancing till midnight. It will be a very special night as it will be the very first time for Thomas & Fhiona to appear in London together and Thomas' first time in London since Feb 2005. Thomas, Fhiona & The Band make their very first appearance at The Invergordon Country & Irish Festival 17-21st July 2008 in Scotland. For ticket and booking enquiries Tel. 01463 221268. Big Tom & The Mainliners return to the stage in 2008 and Thomas, Fhiona & The Band are honoured in being asked to do support at The T.F. Castlebar, Sat 2nd February & Glencarn Hotel, Castleblayney 15th Feb. The Glencarn Country Music Awards were held in The Glencarn Hotel, Castleblayney, Co Monaghan 1st Nov 2007. At the star studded event in front of a capacity audience, Thomas & Fhiona were voted "Best Duo" and received beautiful crystal awards on the night. Thomas & Fhiona attended The Tipperary Mid-West Radio Awards at The Templemore Arms Hotel, Templemore, Co Tipperary on May 29th. They received awards for "Best Duet 2006" for their "We Were Made For Each Other" single. At the Country & Irish Entertainment Awards, Setanta House Hotel, Celbridge, Co Kildare on Mon 26th Feb 2007, Thomas & Fhiona were presented with an Award for Best Single Of 2006 for "We Were Made For Each Other". The award was presented by Radio Presenter Sean Green. Thomas & Fhiona on Stage at Setanta house on Mon 26th Feb 2007 after receiving their award for Best Single 2006. Thomas & Fhiona have just released a brand new single entitled "We Were Made For Each Other". Send those requests for it into your local station! Thomas is no longer appearing on the proposed Torremolina's trip which may not be going ahead now. Thomas, Fhiona and their band to appear at Country Music Weekend - See Forthcoming Trips etc page. Thomas & Fhiona to appear in Bulgaria - See Forthcoming Trips etc page. Join Thomas on The Billy Morrissey trip to Portugal Sept. 2006. For more details see Forthcoming Trips etc page. Thomas & Fhiona have been nominated to possibly receive an award at The Tipperary Mid-West Radio Awards which are to be held in The Templemore Arms Hotel in Templemore, Co Tipperary on Tue 30th May. 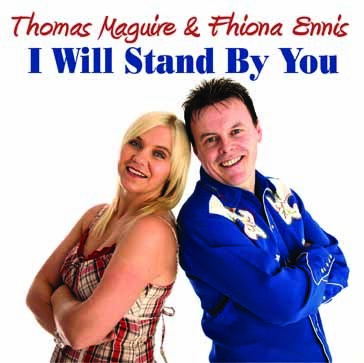 Thomas & Fhiona have just released their first album together entitled 'Promised To John'. For track listing and how to purchase it see the 'New Album' page. Thomas Thomas was voted "Personality Of The Year On The Dance Scene 2005" at The Country & Irish Entertainment Awards Gala At The Setanta Hotel, Celbridge, Co Kildare on Monday 13th Feb 2006. The award was presented and sponsored by Margaret Coskeran from The Shamrock Lounge, Kilross, Co Tipperary. At the same awards Fhiona Ennis was voted"Best Female Newcomer 2005." Fhiona was also voted "Best Female Newcomer" at the recent Radio Star Awards in The Valley Hotel, Fivemiletown 2nd Feb.